What is “Caesar’s Empire” mobile slot about? Caesar’s Empire is a 20-payline, 5-reel (progressive) video slot from RTG Realtime Gaming that has a wild symbol, scatter symbol, multiplier and free spins. The maximum jackpot you get to win in this game amounts to $7,500. The maximum coins jackpot amounts to 7,500 coins with a maximum of 1 coin per line. The option of getting a bonus game is absent in this slot. The progressive jackpot can be won at random after the end of each game. 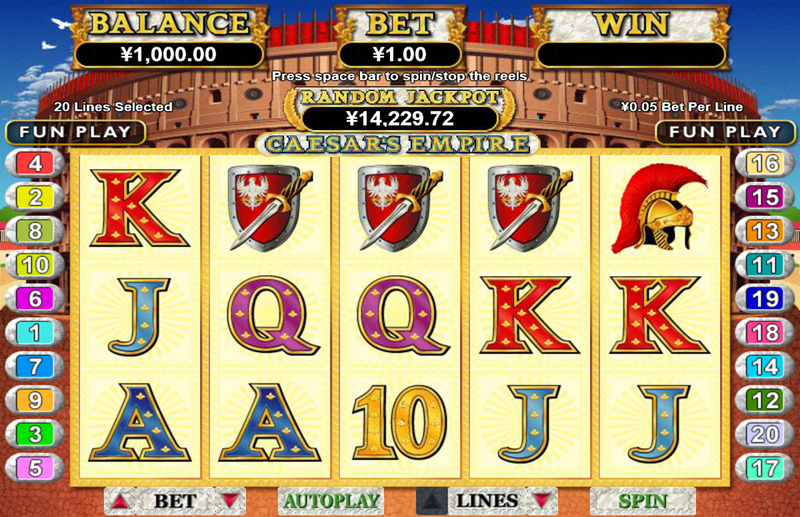 The video slot has a theme based on the conquests of Caesar and has Rome in the background. You get to experience the world of ancient Rome with some quality graphics and sound effects. The symbols in the game are based on Caesar himself, queen Cleopatra, Colosseum, some Roman armours and weapons. The game is easy on the eyes without too much of bright colours and the texts and icons are easy to read. Caesar’s Empire can be played on an Android platform which includes tablets, smartphones, and HTML5 powered gaming mobile phones. In Caesar’s Empire, you attempt to match symbols from left to right across your active paylines. You have 10 different symbols consisting of Roman images, swords, helms and shields. The most lucrative symbol is that of queen Cleopatra and for lower values symbols you would have to hit 3 in a line to win a prize, but for symbols with higher value only 2 in a line would do. The wild symbol in this slot is that of Caesar’s coin which is a golden coin on which Caesar’s character is embodied. This is a free symbol with respect to the fact that it can replace any other symbol on the reels to form a winning combination. The winnings from a combination that has more than 1 wild symbol will be tripled. The progressive jackpot can be won randomly at the end of each game. The Roman Colosseum is the scatter symbol and if you get 2 or more of the scatter symbols anywhere on the reels, then you will end up winning a prize that is multiplied by the total amount of your bet. A combination of four or more Caesars on reels 1 to 4 and a Colosseum symbol on reel 5 can get you 10 free spins. Upon playing the free spins your prizes get doubled and other than that with every Caesar you get in these free spins, you get awarded 5 more extra games. The biggest win is however the Cleopatra symbol, if you match 5 Cleopatra symbols on one of your payline, then you get 2,500 times the amount you wagered. Conquer your empire full of coins!